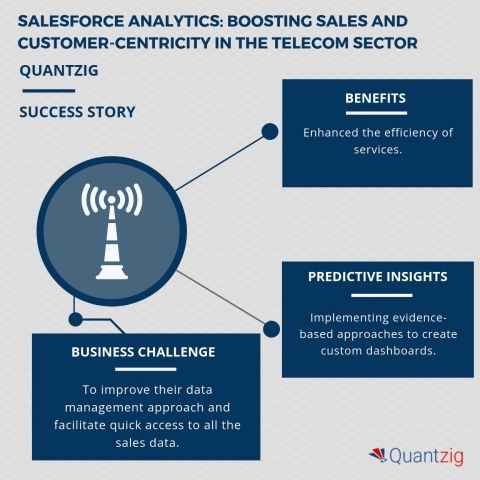 Quantzig’s Salesforce Analytics Solution Helped Improve Customer Centricity in the Telecom Sector – Request a FREE Proposal! A global data analytics and advisory firm, Quantzig, that delivers actionable analytics solutions to resolve complex business problems has announced the completion of their latest salesforce analytics engagement for a leading telecom company. During the course of this engagement, the salesforce analytics experts at Quantzig developed a salesforce analytics dashboard which helped the client to chart progress rates, measure key sales metrics, and improve pricing strategies. Today the telecom industry in the US is highly competitive, saturated, and fast-moving. As a result, the players in this sector find themselves in an ironic situation with a problem many would think is a good one to have. A growing customer base may seem good from a sales perspective, but it poses a major challenge when it comes to data management. With new players entering the market, shifting demographics, and dynamic customer preferences the competitiveness in the telecom sector is poised to grow in the coming years. The Business Problem: The client is a leading player in the US telecom industry, offering advanced communication solutions and innovative broadband services to millions of customers all over the globe. The client found itself struggling to improve sales owing to their inability to effectively channel customer data and understand sales performance. Hence, they wanted to leverage Quantzig’s salesforce analytics expertise to reduce operational costs and enhance service efficiency. Our expertise in the delivery of salesforce analytics solutions at various scales will help you gain clear insights into your organization’s progress rate. Get in touch with our experts to know how our salesforce analytics solutions can help. “As technology advances and customer needs change, telecom service providers will have to identify new upsell and cross-sell opportunities to improve their service offerings on a regular basis,” says a salesforce analytics expert from Quantzig. The Solution Offered: Our salesforce analytics experts adopted a comprehensive three-step approach to help the client identify the root cause of their predicaments. We leveraged customer data as a part of this engagement to help them comprehend customer usage patterns to effectively manage workflows and enhance visibility. Furthermore, the use of a salesforce analytics dashboard empowered the client to track key sales metrics to improve efficiency. Identifying key sales metrics is quite a challenging task. Request a free proposal to know how our salesforce analytics solutions can assist you in improving per capita sales volume and cut down costs without compromising on the long-term revenue goal of your organization. Request a free demo to know how you can apply these methodologies to address your business requirements. Wonder how salesforce analytics solutions could open-up a world of new sales opportunities for your organization? Request for more information now!